Kelly's Korner: It's beginning to look a lot like CHRISTMAS! I'm giving Harper the day off from being photographed or written about today. We woke up this morning with what I thought was a stomach virus but what I think is either teething (because she has two MORE teeth coming through on the bottom) or a reaction to her antibiotic. Either way - not a pleasant day so we stayed home from Bible Study and are resting. I've been cleaning while she has napped and my thoughts have turned to Christmas. I realize it is only October 6th but I'm just so excited about this holiday season. Last year was fun because I was so close to having Harper and dreaming of what she would be like (never knowing how her life would actually start out) but this year I'm thrilled to share the magic of Christmas with her. I know she won't know what is going on - but I love the idea of beginning Christmas traditions with our family and I can't wait to decorate our house like CRAZY! So along that lines- there are three things I want to share with you today that all have the theme of Christmas! And who loves Chris Tomlin???? This girl does. Well - I recently discovered that he is doing a Christmas concert in our area in December with CHRISTY NOCKELS (L-O-V-E her) and Louie Giglio and I MUST go. And then I found out he has a Christmas CD and it comes out TODAY! Who loves Christmas music??? It is awesome. And if you stay tuned .......I'm going to have the MOST fun giveaway next month! It's a stocking full of this CD and his most recent "Hello Love" along with Chris' favorite Christmas Candy, favorite Christmas movie, etc.....How fun is that???? Merry Christmas and Happy Holidays - I'm ready!!!!! I'm the first to comment! I think...I too think Christmas can't get here fast enough!!!! I am excited to do the tour of homes! Check us out.. I am looking forward to Christmas this year too. Last year Lauren didn't quite get the idea but I know she will this year! I have been thinking about Christmas a lot too. I just love the season. It's so full of joy and happiness, I love everything about it. I've even started my shopping. I pulled out all my pumpkins and scarecrows for autumn quite early because I wanted to have time to enjoy them before I put them away and get the Christmas decorations out (which is pretty much the most exciting day of my life). I can't wait for your house tour ... I'll definitely be joining in! It's never too early to start thinking about Christmas. Thanks for sharing the book, it looks like something I'll enjoy! Hoping Harper feels better soon. I think our little one is working on a tooth too. Once we get past the dozen October birthdays my family celebrates I immediately start thinking of Christmas and how I can get a head start on my gift making/shopping. Last year before I put my collection away I photographed lots of them so I would have the photos handy at the beginning of the season. Every day (starting December 1st) I will post a picture of an ornament that hangs on my tree and share the meaning/history/specialness of it. There will be a MckLinky for everyone to play along because it's more fun that way, but most of all I want to record the memories for my kids to read about some day. Hope Harper feels better soon! Me too!!! SO ready for Christmas time and all the fun things that go with it!! Like decorating!! So sad to hear the Boomama passed the torch, but I am so glad it is still going!! I am so ready too!! My son is 1 month younger than sweet Harper, so I am so ready for his first Christmas!!! I think I am going to start decorating mid November!!!!! I love the Holiday season!!! Hope you have a blessed week!! Love Fall & LOVE CHRISTMAS!!! We do a book called The Advent Jesse Tree (by Dean Meador Lambert), and it's wonderful. My kids 3 & 4 love it and it's just a great book. Order it early. I've had it for years and it was fun to see Angie (Bring the Rain) talk about it last year. Dean also wrote The Lenten Tree, which is a book that leads up to Easter---WONDERFUL! Well, you have 12 weeks until Christmas as John pointed out to me yesterday! Those twelve weeks will FLY by I'm sure. Thanks for the shout out, Kelly. 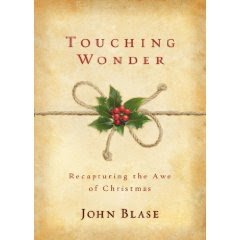 And John is giving away a copy of his book (plus something else fun) each week until Christmas! Hope Harper feels better soon! She just keeps getting cuter and cuter! I'm excited for the holidays too! My son will be 9 months old, and it's just going to be too much fun! 'm so excited about Christmas to! I've already started shopping! I don't think we've ever met, but my husband and I also went to OBU back in the day and we used to live in NWA. This is what a small world we live in: I now live in Savannah, Georgia. My co-worker suggested that I check out your blog because she knew I went to OBU and used to live in Arkansas. Her friend from NYC, who has not ever met you, suggested it to her! I thought it was funny that your blog came to my attention this way rather than from one of my NWA or OBU friends (who I now see also read your blog!). Yes, we are ready for Christmas here, too!! And our church started rehearsing our Christmas music back in August! I am sure you will have a blast with Harper this Christmas- something I look forward to one day!! One of the reasons I love reading your blog is because we are alike in a lot of ways! I'm so excited about Christmas and have already started planning for it. I look forward to the Holiday Shopping Card that comes out in October that supports cancer and gets you 20% off of all the major stores that I shop at. It's so much fun when you have a little one during the holiday season and I just love sharing this special time of year with family and friends. I'm that girl that loves to go get hot cocoa and just ride around looking at Christmas lights for hours. P.S. What happen to your OpenID login for comments? It's only allowing Google Account users. One of my greatest joys is listening to Christmas music! L-O-V-E it!! It makes me happy and I never get tired of it. Celine Dion has a beautiful Christmas CD and Chris Rice has a CD called Living Room sessions that has beautiful songs played on the piano. There are no words, so it is fabulous for Christmas parties or just to play in your home. I play it all the time while cleaning or sitting and reading....it's fabulous! Merry, merry!! Looking forward to the Christmas tours! I missed Boomama's last year and I need some new ideas! Oh I love some Christmas. My baby is due December 30th but I am hoping before Christmas. I am gonna be so big by then I have already decided my hubby and sis need to decorate for me!! :) I can't wait to see Harper's Christmas outfits..I bet you already have some cute things hanging in the closet! Sounds great Kelly! I LOVE to decorate for Christmas as well and have two trees. One Christmas red/lime and one ivory/gold. ~Fun! Just 80 days! Can't believe it- it's my favorite time of year. I've been thinking about decorations too- Harper will have such a wonderful time- a little hint- get her things in BIG boxes- they love to climb in and out of them! I usually go from Halloween decorations straight to Christmas! I just LOVE it and it takes time to get everything perfected. I then enjoy helping my mother decorate and I always decorate for my grandparents. I just love it! I have even been lucky enough to be contract out for a local business to get them ready for the season. Gosh, you have me so excited about Christmas I am just rambling. You are going to have a wonderful holiday with little Miss Harper this year. She will love all of the lights and sparklies. You have probably seen the ELF doll to start as a tradition-I am going to start it with my 7 year old this year. I wish I would have known about him sooner, but Lyndon will still have a blast. The kiddos make it SO fun! YAY! I cant wait for the Christmas tour!! Baby's first Christmas...It will be a special holiday for all of you. My favorite holiday is Thanksgiving. It has escaped all the commercialization, and is all about family, good food and gratitude. I was just listening to some of my Christmas music the other day! I was doing a survey for the radio station about it and then I was looking to see what I had and needed to get! I want to get the Chris Tomlin album but I was excited that Downhere's Christmas album came out today too! I'm going to have to check out that book! And I can't wait to decorate for Christmas! Love your sweet enthusiasm!! I know ya'lls Christmas will be the best ever!! We are going to the Chris Tomlin concert in December. It is going to be great. Let me know if you end up going. Great post I can't wait to decorate for Christmas. Could you remind us again before December 14th? That would be so helpful. You would be like my very own post-it note! I too love Christmas and I also love Chris Tomlin. I love spending the WHOLE month of December focusing on family traditions and on Jesus. ADOREnaments - book with ornaments that celebrate the different names of Jesus. We have a Christmas book tradition and we read a portion of both of these books every night. You should read Treasuring God in our Traditions by Noel Piper. It was a great book to read about having God-centered traditions in your family. I was so excited for the Chris Tomlin cd, too. I will have to check to see if he is coming out here! Thanks to my being in a Christmas show--I've been singing Christmas songs for the past 3 weeks! Another thing to think about right now: Operation Christmas Child (Samaritan's Purse). Boxes are due before Thanksgiving, so now's the time. Thanks for the book recommendation! I may have to buy it...it sounds good! I also love Christmas music! I love when I'm shopping at Hobby Lobby and they are playing Christmas music! By the way, I am loving David Crowder band! I'd never heard of him until you talked about him! Love it! Oh my gosh, I am so excited about Christmas. I love the hustle and bustle and singing of carols, and buying presents. I especially going to church and singing Christmas Carols. It's always such a joyous time. I'm ready too! I can't wait to decorate my home and see everyone elses! I love Chris Tomlin too! And he is coming to Birmingham so we are definitely going! Cant wait! I have already started Christmas shopping! I always start getting excited about Christmas in the fall. We are starting the Elf on a Shelf tradition this year. It's so cute. Look it up if you haven't heard of it before. I have no idea how (or if) you are able to read all our comments! I love Christy Nockels too..you have to check out her new CD..it's fabulous..."Choose" is my fave song, but they're all great. Hope she feels better soon! Im with you on Christmas...I cant wait! Yay!! I love Christmas so much and can not wait to decorate my house!! Grace is finally at an age where she'll really understand it more! And hopefully will leave the decor alone! ha! It's so exciting that Harper will be having her very first Christmas!! Oh I love Christmas time:) The lights, the decorations, the magic...I love it all! And it's just a few weeks away..Yea! I am so ready too! I love Chris Tomlin and I must get that cd now! I went to Junior College with Chris Tomlin!! I also love Chris Tomlin - thanks for letting us know - I will be buying that cd so I can start listening to the wonderful sound of Christmas music early! Yeah! 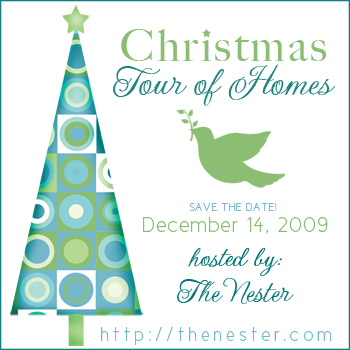 Looking forward to the Christmas Home Tours - that will be great! Hope Miss Harper is feeling better - I cant believe she already has so many teeth! What a sweetie! I have a question about the links for the home/friday tours. I might get some help from other commentors as as I know you, Kelly are super busy and tend to respond better to e-mails... anywhooo, I have posted/linked in before to the different tours and enjoy looking at other peoples. Is there a way to just go down the list or go from one blog to the next? I usually click on one and then go back to Kelly's Korner and click on another one and the go back. Just wondering if there is a better way. Thanks. I LOVE Christmas too and all the smells, sounds, memories and meaning!! I love Christmas as much as the next person, but when I went into Belk's and saw Christmas decorations before it had even turned October, I was extremely disappointed. It's just not as special if it's overdone. Hey, Kelly! We had the same blog title today! TOO funny. Only I was fussin' about it being too early to have Christmas stuff out in the stores. I hope Harper feels better soon. It very well could be the antibiotic that has her tummy so rumbly. Looking forward to seeing your Christmas Explosion!! Ha! Ohhh, K-Love had Chris Tomlin on today as a special guest & they played songs from the new CD...LOVE it! Christmas is such a magical time! Hope Harper feels better soon! The new Chris Tomlin CD just made my day! Thanks for letting me know! OH MY GOSH..I AM SOOOOO GLAD YOU POSTED THIS..I DON'T HAVE A BLOG MYSELF, BC I HONESTLY CANNOT FIND THE TIME RIGHT NOW WITH FOUR CHILDREN, AND TWO BEING 16 MTH OLD TWINS..BUT I DO KNOW PEOPLE THAT HAVE FOUR KIDS AND STILL FIND THE TIME TO DO IT..SO MAYBE AFTER THE FIRST OF THE YEAR I CAN FIND THE COURAGE TO START A BLOG..BUT LET ME JUST SAY, THAT I AM SOOOO GLAD I HAVE READ ABOUT SOMEONE ELSE BEING AS EXCITED ABOUT CHRISTMAS AS I AM..I LOVE YOUR IDEAS..THE CD ESPECIALLY..BC I LOVE LOVE LOVE CHRISTMAS MUSIC..I LIKE IT PLAYING ALL THE TIME WHEN WE ARE HOME OR IN THE CAR..I JUST LOVE IT..AND MY HUSBAND IS ALREDY ITCHING TO DECORATE..I TOLD HIM WE AT LEAST HAVE TO LET NOVEMBER GET HERE AND THANKSGIVING BE SEMI CLOSE BC HE WOULD PUT UP A TREE RIGHT NOW IF I WOULD GIVE HIM THE GO AHEAD..YOU ARE GOING TO LOVE CHRISTMAS THIS YEAR ESPECIALLY NOW THAT HARPER IS HERE..SOMETHING ABOUT A BABY JUST MAKES IT THAT MUCH MORE SPECIAL..I BOUGHT MY TWINS THAT ROCKING CHAIR LIKE ONE OF YOUR FRIENDS BOUGHT HARPER..THAT IS THEIR "BIG" CHRISTMAS PRESENT..I JUST LOVED IT..THANKS FOR SHARING IT..IT'S HARD FINDING SOMETHING TO GET THEM THAT THEY DON'T ALREADY HAVE FROM HAVING AN OLDER BROTHER OR SISTER..BUT THAT WAS PERFECT..CAN'T WAIT TO SEE YOUR HOLIDAY DECORATIONS AND IDEAS..
'Tis the season to be jolly! Haha! I LOVE that you're already talking about Christmas...what a wonderful holiday to celebrate. Thanks for the book and CD recommendations - I will check them out. Also, I need to check out the Praise Baby DVD's. My little girl is almost 1 and I really want her to be thankful for all the Blessings that He has bestoed on her. Oh you have lots of fun stuff coming up! It's making me excited for Christmas!!!! I LOVE Louie Giglio! I'll have to see if they're coming down here! Oh dear, I hope Harper feels better soon! I love Christmas, too, and am ready to start decorating with all the new decorations (and tree!) that I bought last year during all the clearance sales. I love, love, love Christmas!!! I can't wait to have both Dylan AND London enjoy it this year. London was only 3 months old last year, and did care much about any of it. haha! She'll be 15 months this go round, and I know she wont really get the whole meaning of it, but I do think that she is going to love the lights and fun songs and such. Dylan, who is five, really gets excited about our traditions and the Holiday itself. It really clicked for him around three (and some at two) and Christmas has been even more magical ever since! Hope Harper is feeling better! I'm with you - I can't wait for Christmas! Oh, I LOVE Christmas music...and Chris...and Christy! (lots of "Chris" there!) :) Yay. First of all I love your blog and Harper is so adorable. I usually don't post but "stalk" your blog daily to read it. hehe Also.. just wanted to post and say Chris Tomlin is AWESOME. I live 15 minutes from his hometown and work in his hometown in Texas. Just thought I let you know that tid bit of info. So here in Texas especially East Texas are very excited about the new cd from him. I can't wait for Christmas this year. Last year I was recovering from a complicated pregnancy and complicated delivery. This year my oldest daughter will be almost three and I think that she is going to enjoy Christmas to a whole new level this year. My younger daughter will be just over a year old and I can't wait for her to really experience Christmas this year. The Christmas tour will be great!!! I am looking forward to it. She has cancer and its progressed! John Blase married us while he was pastor at 2nd Baptist in Arkadelphia!! Thanks so much for sharing, Kelly! I will def check out the Chris Tomlin CD. I must admit that I just discovered all of this wonderful praise music and I am in love with it! Thanks to you, I just bought my first David Crowder Band CD too!!! I don't even want to think about Christmas yet!! My Fall decorations are still packed away!! Things have been so busy I haven't had a chance to pull them out!! hopefully by the end of this weekend I'll have them out!! I'm in a new house this year and it is definitely a "Christmas house". The decorating possibilities are huge! I cannot wait...and we're hosting this year so I'll have all my sisters and brothers and their families and my mom and my own two sweeties will be home from university...I cannot wait! Did I say that already? Can you tell I'm excited? I listened to Christmas music in the car all day yesterday! The season never seems long enough! Counting down the day's to December 14, hope all those tours don't shut down the internets--then well just have to get in our cars and drive around! Wow I have never done the christmas house tours... can't wait!!! Your post made me so happy...Christmas is a wonderful, exciting time of the year! I'm so glad it's almost here!!! I was excited to see your post on John Blase. When I went to OBU he was my pastor...as a child (and current- when I still go home to visit) his father is my pastor! Last year he came to speak to our home church in Nashville about his book...I never got around to reading it, but his sermon was excellent. Thanks for the post, and reminding me to go get his book. Even though it's just now fall, I've been in Christmas planning mode too! I think becuase I'm excited to have a baby around this year! (o: And can I make a confession that I have ALREADY started listenign to Christmas music?! I love it! I'm so excited for Christmas too...I have almost all of my shopping done. I have my Christmas cards completed, stuffed and mostly addressed. I have plans for get-togethers at work and with friends and family. It's already coming along quite nicely! You need to get Harper the Little People Nativity for her to play with. Most of our Christmas decorations are not child-friendly, but we display ours every year where the kids can reach it and play with it and we can talk about what Christmas really is about...the birth of our Savior. I am off work this week and my main focus is getting most of my gifts bought and wrapped. Working in retail is the pits around the Holidays. Sometimes I really have to re-focus about the fact that I am celebrating a Person. A Person born in such humble dwellings. It's tough. 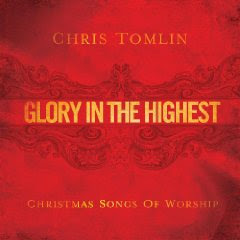 love Chris Tomlin, love CHRISTY NOCKELS, love Louie Giglio and I LOVE the spirit of Christmas and all that it entails!! Hope your Harper is feeling a little better!! I must say that Christmas is my absolute favorite time of year!!! AND I too am super obsessed with Christy Nockels! One of the groomsmen in our wedding plays in her band, so we I've seen and met her several time. She's just so darn cute and amazing! And what's not to love about Chris and Louie! Living in Atlanta we have the upper hand because well, Louie's been working here forever and Chris and Christy just moved here to help start the Passion City Church in Atlanta. It's insane!!! Oh, I've got to run out and get that album of Chris'. Love him! Ooooh I am super excited for Christmas too. AND. I. LOVE. CHRISTY. NOCKLES. TOO. ADORE her! Ive been looking forward to it all year.